Google+ recently announced its new Pinterest – like feature, called Collections, which enables users to organize content by category. 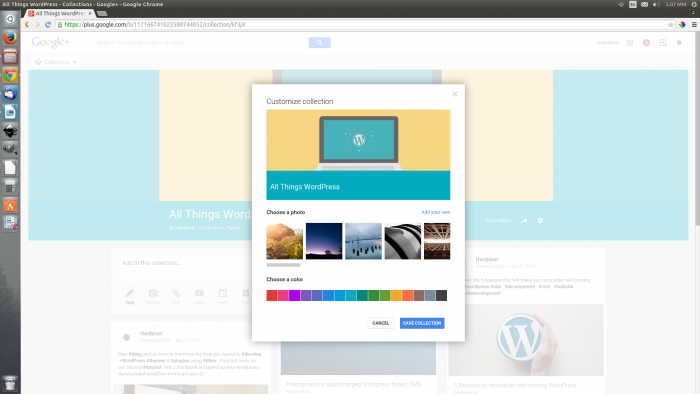 Collections are like a sub-feed of a main Google+ page. 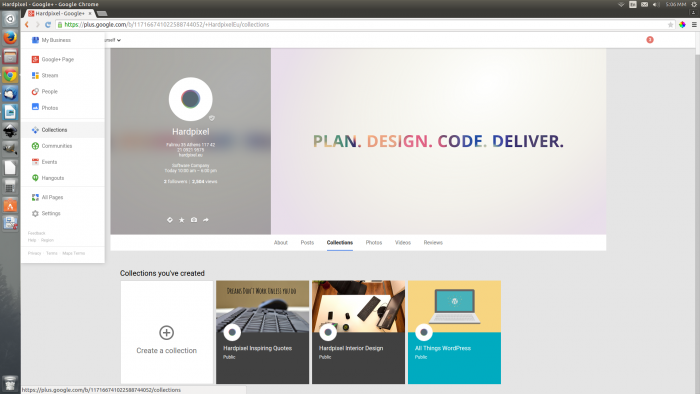 Google+ users have now the ability to create a space where they can organize their photos, videos, posts, etc, by topic. To get started on Collections, click on Home menu in the upper left-hand corner, choose Collections, then click the Create a collection button. Fill out the name, set the visibility permission, then click Create. 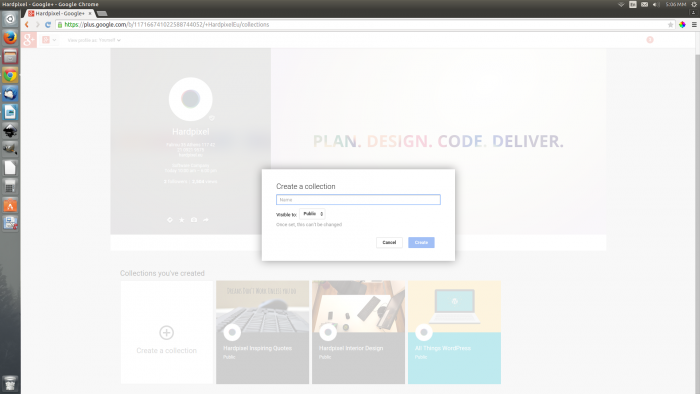 When the collection page loads, click Customize to change the header image and page color. Collections can be created by users or Pages and can be shared either publicly or privately, or even within a specific set of Google+ users. Additionally, they can be followed, however they differ from Google+’s Pages or Communities in the way that only the creator can add/ modify content. Collections created by a user will appear in his/her profile stream for his/her followers. Anyone following a Google+ user, is following his/her shared collections by default (depending on his privacy settings). However, settings can be changed, so that followers choose specific collections they want to follow. This feature is currently available for Android and the Web only, with iOS to follow later, according to Google. Previous Google+ / Google Page posts can be moved into Collections by clicking the arrow to the right of the share icon. Keep in mind, only public posts can be shared to public Collections. There might be more than one post that you wish to move to a Collection. Make sure to move them all at once, so Google groups them and prevents you from spamming your followers. After creating a Collection, you will not be able to change its visibility settings. However, you can choose a specific circle of users, which can be later edited further. A Collection can be shared either via the share button (by clicking the arrow) or by copying the URL of the Collection’s page. There is also a limited number of Collections that you can follow. That number is still being determined now. Currently there is no way to hide posts added to Collections from your profile feed. So far, there is a limit on Collections’ creation, to only 50 per user. Users can’t put a post into multiple collections, unless they either post it twice, or create a combined Collection. Users can reshare from a collection to another collection but this actually means a creation of a new post. What do Collections mean for marketers? Undoubtedly this new featured will be embraced by marketers, since brands will now have the ability to create topic-based feeds on Google+, enabling fans to follow specific categories that they are actually interested in. Users can follow / unfollow a collection at any time depending on the relativity of their interests. Brands and individuals can segment their business into Collections, creating different orientated topics, featuring their most prominent products or services and sharing related content to target specific demographics and interests. And users on the other hand, can follow only the Collections they are interested in, thus having a more pleasant Google+ news feed experience. Therefore, happy followers can easily convert into a highly engaging audience and that’s the element that makes Collections a valuable tool. What do you think about Google+’s new feature? Have you created your first collection yet?